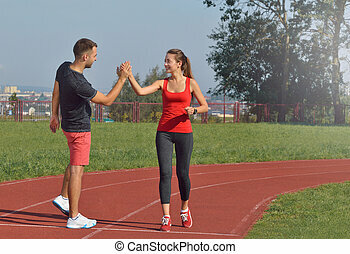 Fit young woman high fiving her boyfriend after a run. Fit young woman giving high five to her boyfriend after a run. 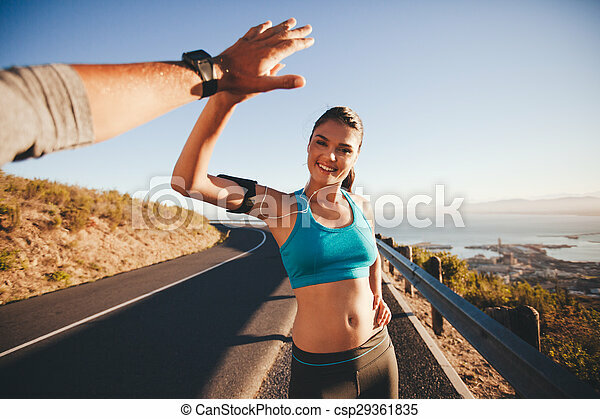 pov shot of couple high fiving on country road in morning. Fit young woman giving high five to her boyfriend after a run. POV shot of couple high fiving on country road in morning. Fit young woman giving high five to her boyfriend after a run. Healthy fitness concept with active lifestyle. Fit young woman giving high five to partner after a run. Healthy fitness concept with active lifestyle. Young athletic woman runner rest after running outdoor. Tired girl holding her hands on the knees. Young athletic woman runner rest after running outdoor in the forest. Tired girl holding her hands on the knees. Young athletic woman runner resting after running and jogging training outdoor in the forest. Tired girl holding her hands on the knees. Beautiful young athletic woman rests after running or jogging outdoor in the forest. Tired girl holding her hands on her knees. 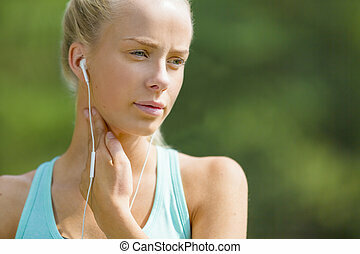 Young athletic woman checking her heart rate after workout outdoor. 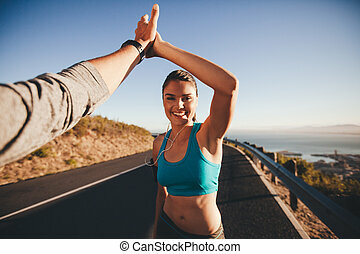 Fit young woman high fiving her boyfriend after a run. POV shot of runners on country road looking happy outdoors with bright sunlight. 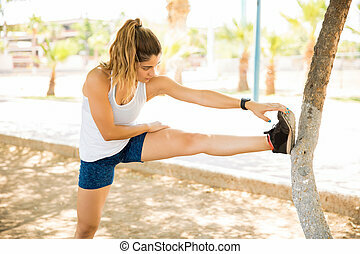 Young woman doing some stretching after a run. Runner leaning on road guardrail relaxing her calf muscles. 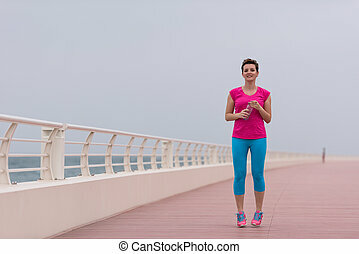 Outdoor shot of a young woman on her morning run. 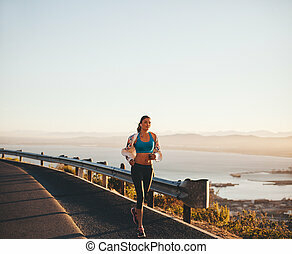 Female athlete running on country road. 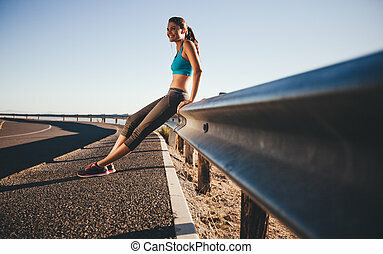 Outdoor shot of happy young woman sitting on highway guardrail after a morning run. Fit woman on country road taking a break after outdoor workout. 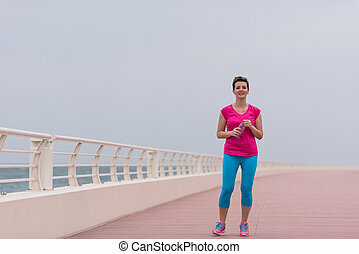 Outdoor shot of woman stretching her legs before a run. Determined runner preparing for outdoor training looking away. 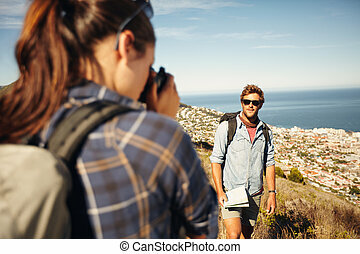 Young man posing in nature, with woman talking his pictures in countryside on a summer day while hiking. Young woman taking photo for her boyfriend with a camera. Determined young woman warming up before a run. 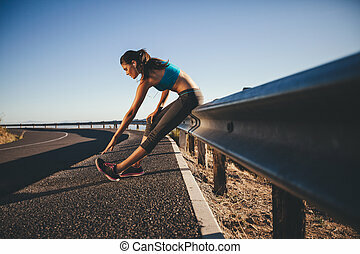 Female athlete stretching her leg on road guardrail in morning. Outdoor shot of fit young joggers stretching before a run together in morning. 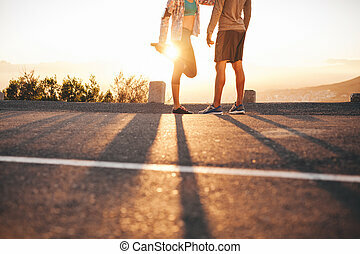 Young man standing and woman stretching her legs at sunrise. First person view of a man and woman high fiving. 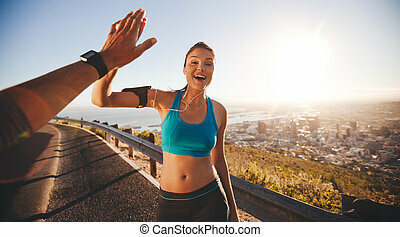 Happy young woman giving high five to man after outdoor training. Couple of runner on country road looking happy. Cropped shot of fit young couple warming up before a run together at sunrise. 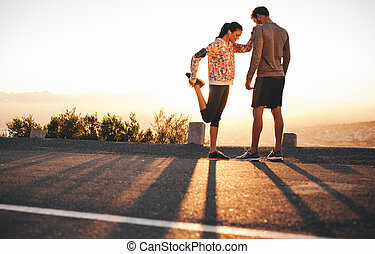 Young man and woman exercising in morning. Tired young woman relaxing after a outdoor training session. Runner resting on road guardrail after morning run. 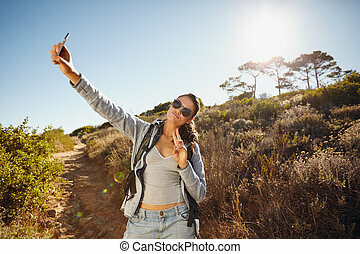 Happy and energetic young woman taking a selfie. She is holding the mobile phone camera high posing and gesturing victory sign with her hand. Caucasian woman hiking on a sunny day. 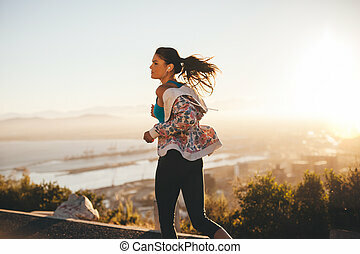 Outdoor shot of a young woman on her morning run. 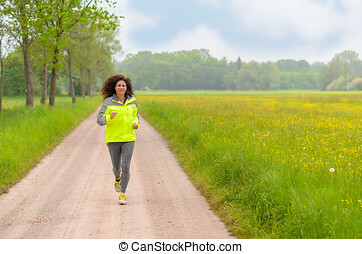 Fitness woman running on country road. Female athlete stretching her legs outdoor before running. Fit young woman warming up for a run on country road. Shot of fit female runner in morning with bright sunlight. 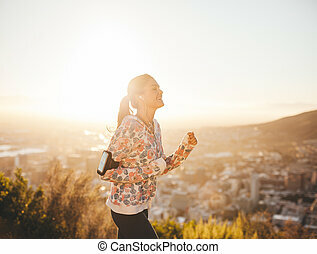 Young woman outdoors on a run smiling.